Chicks: The juveniles are a different color? For how long? Question: The young peregrines seem to be a different color than their parents. How long does this color difference last? 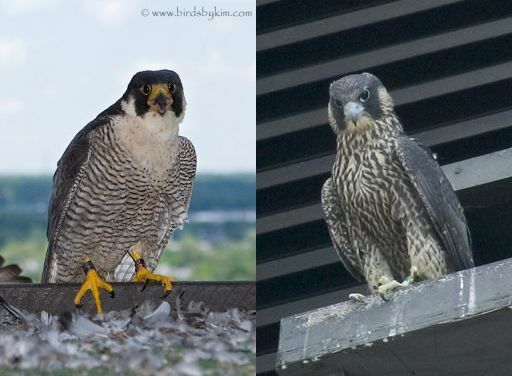 Answer: Here’s a good side-by-side comparison of an adult and juvenile peregrine falcon. This happens to be a mother peregrine and her youngster from Wilmington, Delaware, both photos by Kim Steininger. The adult female on the left has charcoal gray-and-white plumage. Her chest and throat are white or rosy-white. Her belly is white with horizontal dark gray stripes and the insides of her wings are striped like her belly – but more so. Her back and head are charcoal gray. The cere (the skin on her face near her beak) and the skin around her eyes are both yellow. Her legs are a very bright yellow. Compare this to her offspring whose plumage is dark brown and cream-colored. The youngster (I’m guessing it’s a female) has a dark brown head and back. Her belly, throat and the insides of her wings are striped brown and cream. The stripes on her belly are vertical instead of horizontal. Her cere is pale gray and her legs are pale yellow. Often juvenile peregrines look very dark when in flight but this isn’t a reliable field mark because of variation in plumage and sunlight so I use a clue to tell the difference at fledging time: Juvenile peregrines have a cream-colored band at the tip of their tails that the sun shines through. Adults in fresh plumage have a narrow white band on their tail tips, but by the time their youngsters fledge the adults’ plumage is a year old and the tips of the tail feathers have worn off. Peregrines molt (replace) all their feathers every year. Those in the middle latitudes, such as Pittsburgh, molt in the summer after their youngsters have fledged. Peregrines lose and regrow a few feathers at a time, not all at once. Their wings and tails lose the exact same feather on both sides so their ability to fly is not hampered. Juvenile peregrines remain brown-and-cream colored until they are one year old – the time of their first molt. The difference in coloration is an advantage for them because they are easily recognized by adults and not attacked when they pass through established nesting territories. They go in peace. They’re obviously too young to breed.